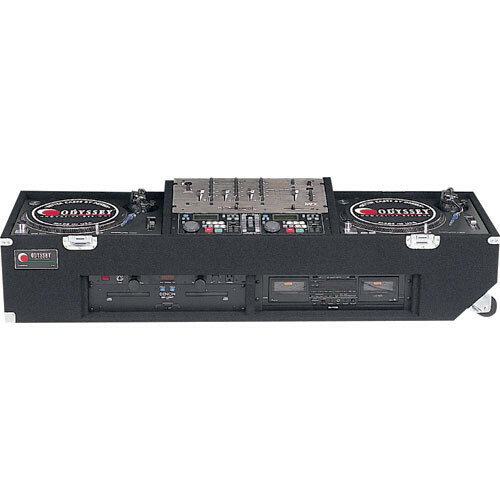 The Odyssey Innovative Design CDJ1906W Carpeted DJ Turntable Coffin Case (Black) is made to carry and protect two 1200 style turntables, a 19" mixer and has a two 3U vertical rack spaces for CD players, amps or other hardware. The case is made of heavy-duty felt carpet glued over plywood and is fully foam lined. The carpet covering looks great and provides a durable surface for years of service and protection. The case includes a hinged lid, heavy-duty steel corners and recessed butterfly latches. It is transported by recessed handles and built-in wheels.